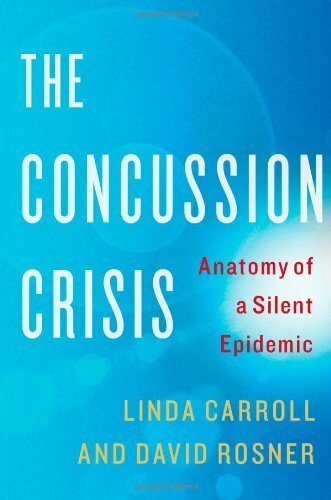 The Concussion Crisis: Anatomy of a Silent Epidemic should be required reading for parents, teachers, amateur and professional athletes, coaches, trainers, and anyone interested in the health of children and young people. That would comprise most of us. Linda Carroll and David Rosner have crafted a riveting look at a health crisis that is finally coming to light after decades of denial. With impressive backgrounds in health and sports journalism, the authors seek to enlighten those who might still think that concussions are no big deal. They make a convincing case that “getting your bell rung,” a term signaling concussion that is all too often used by athletes, is not an expected part of competitive sports, but rather a location on the continuum of traumatic brain injury. The statistics are startling. Over a 10-year period, emergency room visits for concussions doubled among children age 8 to 13, and more than tripled in teens age 14 to 19. The Centers for Disease Control and Prevention (CDC) estimates there are between 1.6 million and 3.8 million sports-related concussions per year. The number may be much higher because so many people fail to report concussions, believing them to have little significance. But as the authors show through stories of real-life people, there is no such thing as a minor concussion. Every concussion is a potentially devastating injury. These stories focus on concussions among athletes of all ages, as well as concussions among soldiers and victims of auto accidents. Some of the stories are heartbreaking: adolescents who suddenly die after what appears to be minor head injuries; boxers and football players with early-onset Alzheimer’s disease and dementia; and returning veterans left to wander through the medical system seeking treatment for their unrecognized or misdiagnosed concussions. This book teaches us a whole new vocabulary: impact seizures, second impact syndrome, post-concussion syndrome, metabolic cascade, chronic traumatic encephalopathy, and sub-concussive hits. A college football player tastes metal every time he’s hit in the head. His doctor says he’s having localized seizures. Several teens die suddenly after sustaining a second concussion before they’ve fully healed from the first one. A series of chemical cascades in a concussed brain leads to progressive brain damage. And the brains of dozens of boxers and football players show changes of dementia due to chronic head trauma. Injured players tend to downplay brain-sloshing head impacts so they can quickly return to the game. Nobody wants to watch a “sissy” quarterback or goalie, right? Coaches and trainers often return concussed players to the game within minutes. Sports culture celebrates athletes who shrug off concussions. Since most don’t result in loss of consciousness and players are eager to resume play, why not allow it? Because concussions may lead to life-altering and life threating complications if not promptly recognized and treated, that’s why. Most concussions don’t result in loss of consciousness and don’t show up on routine imaging studies such as CT and MRI scans. Concussions are instead diagnosed by assessment of symptoms, such as headache, confusion, amnesia, dizziness, and problems with concentration and balance. Even better is the use of one of the sophisticated neuropsychological testing programs such as ImPACT (Immediate Post-Concussion Assessment and Cognitive Testing). Some assessment tools are administered via computer in a clinic; simplified versions can be utilized on the playing field. In Concussion Crisis we meet a few of the doctors and researchers making new discoveries about brain science in leading laboratories around the nation. We are introduced to patients and family members whose compelling testimonies before congress and athletic governing bodies are bringing about much-needed reform in the management of head injuries. Concussions are finally getting the respect they deserve. For years, NFL doctors said that concussions were benign and without long-term consequences; however by the end of 2009, the NFL did a nearly complete turnaround in how it handles concussed players. Keen-eyed observers will note fewer purposeful helmet-to-helmet charges during pro games. By early 2010, a poster warning players about concussion was developed by the CDC, NFL, and other groups. The poster now hangs in every locker room in every pro football venue. A similar poster for younger players is used in high schools and colleges. Some sports organizations routinely perform preseason screening; If an athlete has a concussion, the results can be measured against baseline to more accurately monitor recovery. Concussed players should be assessed by physicians who will commonly prescribe both physical and cognitive rest. Those who need it, receive rehabilitation services specifically designed to combat the invisible results of concussion affecting memory, mood, difficulty with thinking and concentration, and other cognitive functions. Some 350 living athletes in several sports have agreed to donate their brains to Boston University’s Sports Legacy Institute, which examines athletes’ brains after their deaths for signs of concussive damage. The Institute is opening a program soon to receive brains from soldiers who sustain head trauma in war. While scientists have developed specialized imaging techniques to detect concussive brain damage, such tests are not readily available at present. U.S. Army doctors are working on a blood test to detect brain injury. Just as the injured heart releases certain chemical markers into the bloodstream, so does the injured brain. This could revolutionize the rapid diagnosis of concussion. There has been a big improvement over the past two years in how concussion is recognized and treated. Even so, more changes are needed. The concussion management techniques used by the newly enlightened NFL must be pushed out to all sports and down to all age levels because younger brains are even more sensitive to injury than adult brains. The Concussion Crisis is a big step in the right direction. People who read this fascinating and eye-opening book will never think about concussions and head injuries in the same old way. There is no such thing as “just a concussion.” The human brain does not discriminate between little hits or big hits. They are all forms of traumatic brain injury.